Concrete Protection - Concrete Interface Treatment Agent - MUHU (China) Co., Ltd.
MNC-302 concrete interface treatment agent, a kind of cement mortar adhesion intensifier, is of a double component emulsion using the water-emulsion epoxy resin as its basic material, with outstanding adhesive ability with many basic materials such as smooth concrete, veneering bricks and slabs, metals, lumbers and plastics, as well as excellent water resistance, moisture and heat resistance, anti-freezing/thawing and aging performances. It can be used in the construction of moist base course without toxic pollution. In addition, the application processing technology results in simple construction and significantly saved consumption, so such agent has been used widely in building decoration, reconstruction of old buildings, and moisture proof and waterproof fields, etc. Instead of such procedures as the degreasing with soda washing and the manual roughing for the smooth concrete surface, the direct plastering followed by coating with MNC-302 can improve over 10 times the adhesive ability of the mortar and concrete base course. As a result, the mortar hollow problem existing in the building engineering is solved. Such product can also be used at any location such as wall surface, floor, ceiling, beams or columns. MNC-302 can also be applied on the smooth base course surfaces such as metals, plastics and lumbers, (for example, steel structure, PVC board, xylolite slab and TK, etc.,) in order to make plastering course or thick fireproof and decoration coats on them. 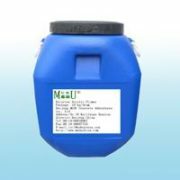 MNC-302 can be used in connection between new and old concretes for concrete construction joint, reinforcement of beams and columns, and reconstruction of the old foundation. The shear strength of new and old concrete interfaces after treatment is increased by above 3 times. Coating MNC-302 on the back of bricks and slabs and using cement mortar for the leveling course is the most economic adhesion technology, which has a adhesion ability of about 4 times higher. MNC-302 has good immersion and emulsification functions. The plastering after its direct application is available for the base course with less greasy dirt, and RD-302 should be used after cleaning up of the course with large number of greasy dirt. Waterproof and moistureproof paints: refer to-Waterproof Method. 2) The data marked with * is the figure available after roughing and coating with YJ-302, with the concrete damaged partially and integrated interface. 2) The general plastering may not be extended with fillings, and the quartz powder or cement can be extended for connection between new and old concretes; extending the cement results in high strength but fast drying, and attentions should be paid to that the construction should be carried out under the wet condition obeyed. The components A and B are mixed evenly respectively, and then poured them into a vessel at a proportion and mixed evenly. Finally, they are extended with certain fillings and mixed to be mushy for use. The processing agent mixture should not be too much in each preparation and should be prepared on the basis of consumption as required. The prepared processing agent has a valid service life, i.e., 2 hours in summer and about 3 hours in winter. The loose part of concrete base course will be weeded, and then bosomed or washed off surface floating dust. The moist concrete base course or existence of demoulding agent from the templet is permitted, but seeper or massive greasy dirt is forbidden. The prepared processing agent is brushed on the base course surface evenly, (including various base courses such as new and old concretes, cement asbestos board, xylolite slab and plaster board) and then applied with cement mortar immediately when the agent is not dry. If the processing agent is fast to dry after applied in summer, it can be applied manually after the base course is wet with water. The veneering bricks and boards such as the face brick are not required immersing in water, and only wiping off the floating dust on their surface. The face brick to be stuck will be brushed with processing agent once on its back, and then applied with cement mortar immediately for paving. It is permitted to brush only 4/5 middle part of the face brick, with its edge not to be applied with the agent. During paving construction of the face bricks, in addition to the MNC-302 grout to be brushed, the wall surface with binding plaster should be stuck immediately so as to lie mosaics into in the plaster, which will be compacted and leveled; papers can be thrown about 2 minutes after mosaics are stuck, followed by joint correction, adjustment and joint cleaning. Paving of the mosaics, in fact, is only an additional procedure to brush the processing agent on the basis of the traditional method. Its basic procedures are same as those of the base course plastering. When the concrete cannot be poured under the wet condition immediately after MNC-302 is brushed due to template and reinforcement barriers, such method can be used instead of the roughing, namely before the template is set up, brushing MNC-302 (extended with cement) in advance, on which sands are spread so as to make the concrete surface rough. The construction and curing temperature should be above 0 degree C, preferred to above 5 degree C. The curing system is same as that of the cement mortar or the concrete. The components A and B should not be mixed during storage, with the storage temperature not lower than 5 ℃. The shelf life is a half year to one year. The component A can still be used after mixed evenly if water is found separated out of it.